Earlier this year, I finally joined the 21st century when I got my first smartphone. Previously I rejected new-fangled touch screens in favour of a phone with buttons, so I could make calls, send texts, and not a fat lot else. Despite my Luddite tendencies, I am now a complete convert. Turns out I love checking emails, blogs, Facebook and Twitter on the move. I’ve become evangelical about apps that pay me to shop and walk (of which more another day). Without a smartphone, I don’t think I would have started running and staggered through Couch to 5K. However, I don’t spend my whole time glued to the screen, ignoring people and tripping over the kerb. It’s actually helped me take a closer look at the wider world. One of the big things that finally propelled me to make the leap was the photo-sharing app, Instagram. I do love taking photos, and used to potter around with a small point and shoot camera in my bag. Instagram however has no truck with digital cameras. You can only upload photos from smartphones, and not computers. 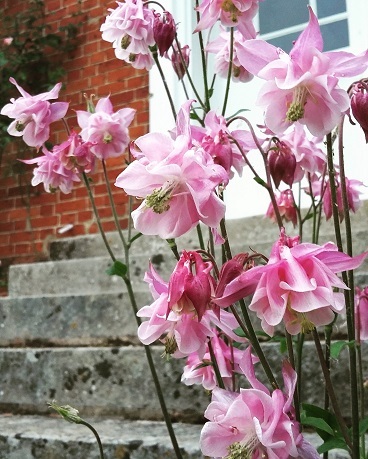 So, although I’m rather late to this particular party, I’ve started posting a flower a day on my Instagram feed. Aside from my delight in capturing images, it’s making me notice what’s coming in to flower when. I can scroll back through the pictures for a record of the development of our garden, the passing of the seasons and the places we’ve visited. I’ve been pestering people to help me identify assorted unknown plants, although much is still at the level of “pale pink rose”. Thinking about photos to post has made me much more aware of sunlight through leaves, the shadows in the house and the beetles and bugs pointed out by my children. It means I actually take the time – even if it’s only a few minutes in the morning – to focus on the small beauties around me. 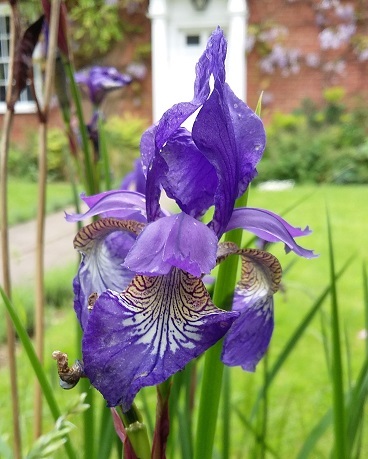 Looking more closely at our garden costs nothing at all, but provides enormous pleasure. In these times of chaos, it provides moments of calm. It’s also given me new connections further afield. An unexpected bonus is the international nature of Instagram. Surprise, surprise an image sharing site is much more accessible to people who speak different languages than the likes of blogs or Twitter. I’ve stumbled across truly beautiful photos from anywhere from Finland to Guatemala. I’d been meaning to post about my “flower a day” efforts on Instagram for a while, but was finally prompted to do so by post by Sadie on her previous blog, The Sadie Diaries, about acquiring her own smartphone, and starting out on Instagram. Anyone else into Instagram? Let me know so I can come and look! Still not persuaded that I actually need a smartphone! I always felt that way too. In fact I don't actually need a smartphone now. But I enjoy it, and it brings me great pleasure, so I'm glad I got one in the end. I love this post, and I understand it so well! For years I have refused a phone. I'm such an old fuddy duddy sometimes. Now I'm delighted to have one, the feeling of snapping and posting is just fantastic. And like you, being able to capture, save and share a flower in an instant is something I am loving. I doubt I'll ever take a selfie, but flowers? Always. Thank you for the mention, you actually made my day! I was reading your blog on the new phone and exclaimed so loudly that Violet thought I'd dropped it! Oh good glad you liked the post, and I definitely thought credit was due in prompting me to mention Instagram. The whole pouting selfie phenomenon is a bit weird isn't it? I've been taking a selfie after every run, to document my progress, but they're very definitely not for public consumption! Going on your Insta right now and join. And I had to laugh about your Luddite tendencies; I'm exactly the same !! Thanks for coming to visit on Instagram, and good luck with your three-year challenge! Thanks for letting me know, enjoyed seeing all the lovely things you make, especially as I'm now mourning the end of the Sewing Bee. When my first grandchild was born in April, the family all ganged up on me to get into the 21st century so I could share all the Whats App highlights. I am so glad I caved in and the phone has a great camera too. 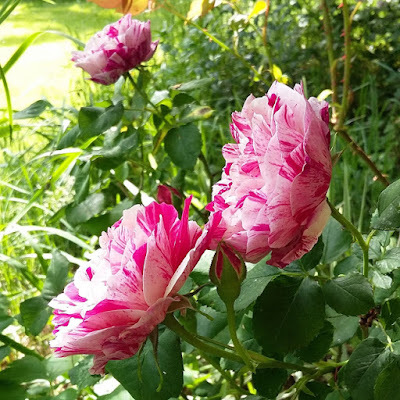 And I love the stripey rose photo you took – i am planning to get one for our garden as we saw loads of them in a National Trust garden recently and loved them and their perfume. Glad you love your phone! The stripey roses really are lovely. We're so lucky that one of our predecessors planted lots of old fashioned roses that smell amazing, rather than beautiful but scentless types. As important as all these meanings of the lotus flower is that it also stands for "non-attachment". This is symbolized by the lotus flower's peculiar characteristic to emerge from the murk and the dirt of its birth place untouched and unaffected, as clean, pure and unblemished as if it came from under crystal clear waters.